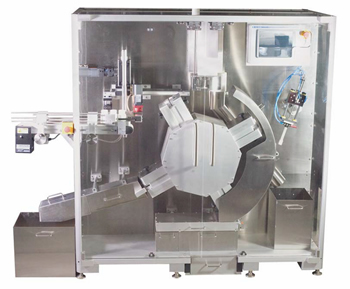 The CapAway 50™ automatically separates solid dose product from capped polymer bottles of various shapes and sizes. Its ease of use requires less than one hour operational training on the HMI touchscreen. The CapAway 50™ comes with a full compliment of diagnostic and safety features. Minimal change parts require 15 minutes to change bottle size. Open balcony style machine for ease of accessibility and cleaning.